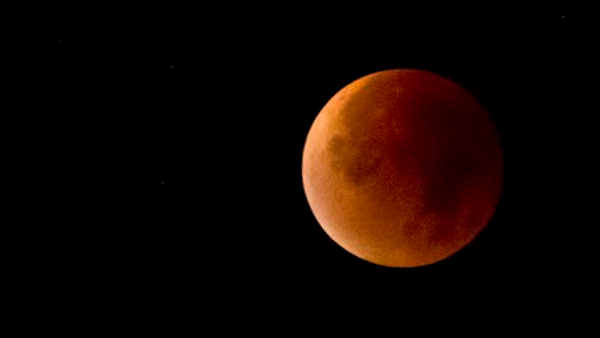 NEW YORK -- Stargazers were being treated to a rare astronomical phenomenon when a total lunar eclipse combined with a so-called supermoon. It was the first time the events have made a twin appearance since 1982, and they won't again until 2033. For the first time in more than 30 years, a supermoon coincided with a lunar eclipse, and people around the world went outside to capture the rare natural phenomenon. That coincides with a full lunar eclipse where the moon, Earth and sun will be lined up, with Earth's shadow totally obscuring the moon. The event occurred on the U.S. East Coast at 10:11 p.m. EDT (0211 GMT) and lasted about an hour. In Los Angeles, a large crowd filled the lawn of Griffith Observatory to watch the celestial show while listening to Beethoven's "Moonlight Sonata" played by 14-year-old pianist Ray Ushikubo. "You always want to see the eclipse because they're always very different," said astronomer Edwin Krupp, the director of the hilltop landmark. Krupp said the additional component of the earth's atmosphere adds "all kinds of twists and turns to the experience." "What we see tonight will be different from the last event: how dark it is, how red it is. It's always interesting to see," he said.